Pirithous was a named hero in Greek mythology, a contemporary of Theseus, Jason, Peleus and Telamon, although, today, his deeds are less well known than those of his famous contemporaries. Pirithous was normally said to be the son of Ixion, King of the Lapiths, and his wife Dia, daughter of Deioneus, making Pirithous brother of Phisadie. In keeping with the heroic tradition though, Pirithous was also named as a demi-god, in which case whilst his mother was Dia, his father was said to be Zeus. The name of Pirithous was said to have come about for when Zeus had seduced Dia, he had done so in the form of a horse circling around her. Pirithous was said to have ascended to the throne of the Lapiths early in his life, for his father, Ixion, was exiled from Thessaly for the murder of his father-in-law, Deioneus, and then imprisoned for eternity in Tartarus for his impropriety upon Mount Olympus. The Lapiths were a legendary group of people residing in the valley of Peneus and upon Mount Pelion in Thessaly. In Greek mythology, Pirithous is famous for his friendship with Theseus, another noted Greek hero whose endeavours included the slaying of the Minotaur; and a tale is related about the meeting of the two heroes. The reputation of Theseus was spreading across Ancient Greece; and Pirithous wished to see whether Theseus was deserving of it. Pirithous would thus travel to Marathon to rustle come of Theseus’ cattle, but Pirithous made it obvious who had committed the crime and where the missing cattle could be found. Theseus of course set off after Pirithous, and the pair would eventually meet. Both Pirithous and Theseus armed themselves and combat began. The pair found themselves evenly matched, with neither able to gain the upper hand in the fight. Eventually, both set aside their weapons, and made an oath of friendship, which would endure for many years. Subsequently, both Pirithous and Theseus were named amongst the hunters of the Calydonian Boar, although any exploits in Calydon were overshadowed by the work of Meleager and Atalanta. Thus, Pirithous comes to prominence for events at his own wedding. Pirithous was marrying Hippodamia, a daughter of Butes or Atrax. The marriage of any king in Ancient Greece was a major event, and so people came from far and wide to attend the festivities. Amongst the assembled guests were the centaurs, cousins of Pirithous, for the centaurs were born to Ixion, or to a son of Ixion. The centaurs were considered savages though, and had a reputation for carrying off women, and as the centaurs got more and more drunk and the wedding feast, so their base nature came through, and a concerted effort was made to carry off Hippodamia and the other female guests. Pirithous though was not the only hero present at the wedding, for amongst the invited guests were also Theseus, Peleus and Nestor, as well as kinsmen of Pirithous. 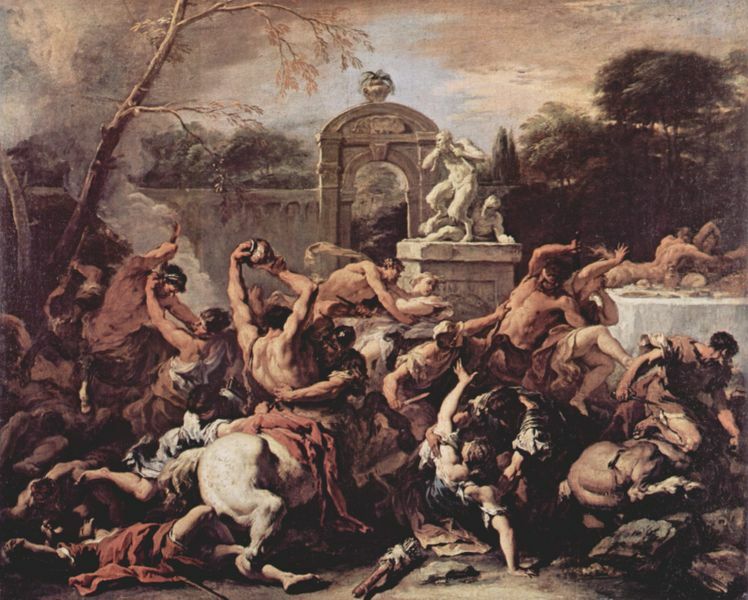 When trouble started Pirithous and his comrade quickly took up their weapons, and a mass battle soon ensued, a battle known as the Centauromachy, the War of the Centaurs. ​The wooden clubs and brute strength of the centaurs was no match of the skill and superior weapon of Pirithous and the other heroes, and soon many centaur lay dead upon the battlefield, and those that survived were driven from Mount Pelion to more remote areas of Ancient Greece. The prestige of Pirithous was such that Homer, in the Iliad¸ saw fit to have Nestor state that Pirithous was amongst the strongest of all men ever born, and a hero defeated all armies who stood before him. The marriage of Hippodamia and Pirithous was said to have brought forth one son, called Polypoetes. 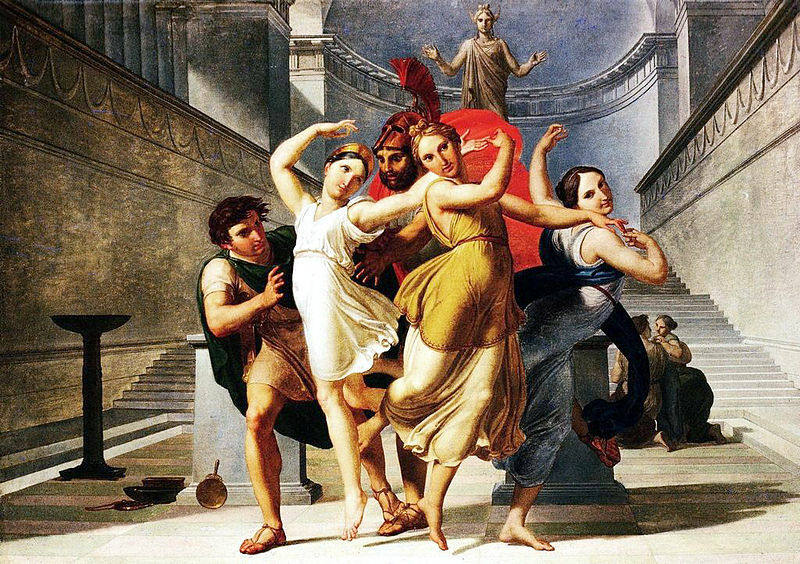 In adulthood, Polypoetes was a named hero like his father, for he was numbered amongst the Suitors of Helen, and an Achaean hero of the Trojan War, where Polypoetes took a force of 40 ships to Troy. Polypoetes was also one of the Greek heroes to hide within the Wooden Horse, and ultimately survived the Trojan War. The marriage of Pirithous and Hippodamia did not last long, for Hippodamia would die, possibly whilst giving birth to Polypoetes. The widowed Pirithous would travel to Athens to visit Theseus, and there discovered that Theseus’ wife, Phaedra, had also died. The pair of friends determined that they should find new wives for themselves, and also decided that only daughters of Zeus were worthy of two heroes of their stature. 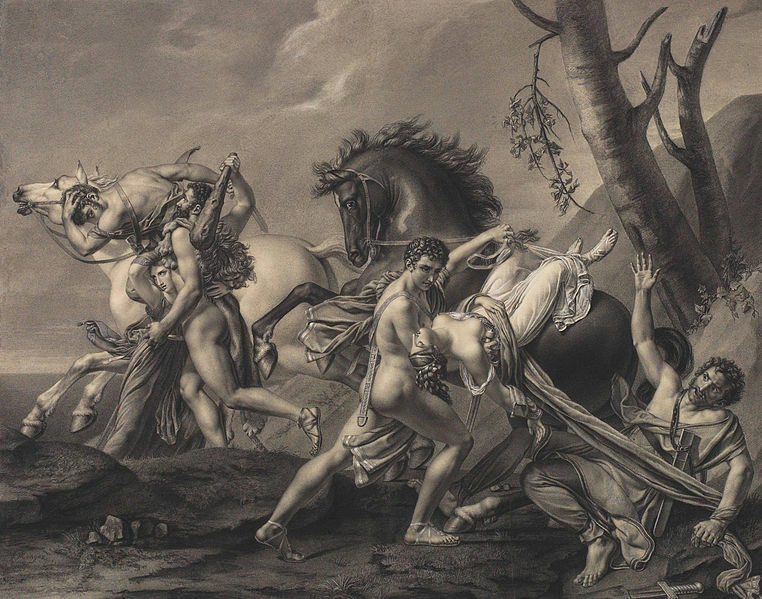 First, Pirithous and Theseus headed to Sparta, for there resided Helen, the young daughter of Zeus and Leda, and with Tyndareus and the Dioscuri absent it proved an easy task to abduct Helen, and take her back to Athens, leaving her in the town of Aphidnae. Some say that Theseus had decided to make Helen his wife when she came of age, and some say that Theseus won her when lots were drawn between Theseus and Pirithous. The second daughter of Zeus targeted by Pirithous and Theseus was an altogether different prospect for this daughter was a full goddess, the daughter of Zeus and Demeter, a goddess named Persephone. The problem was that Persephone already had a husband, the god Hades, and at that time of the year, Persephone, was residing in the realm of her husband. Undaunted, Pirithous and Theseus would descend into the Underworld. Now whether they intended to abduct Persephone, or simply ask Hades to give up his wife, is not entirely clear, but in either case Pirithous and Theseus safely traversed the dangers of the Underworld until they were in the presence of Hades himself. Hades, presented them with a banquet, and bade Pirithous and Theseus to sit upon some stone seats. As they did so, so the stone came alive, and imprisoned the pair where they sat. The impudence of Pirithous and Theseus had angered a powerful god, and the Erinyes, the Furies, were sent to torture the pair. Days turned into weeks, weeks into months, and months into years, and there Pirithous and Theseus remained imprisoned, until Heracles, a cousin of Theseus descended into the Underworld. Heracles was on his last Labour, to bring back Cerberus, when he came across Pirithous and Theseus. Heracles broke the stone bindings of Theseus, but when he went to do the same for Pirithous, the earth shook, it seemed that Hades believed the crime of Pirithous was greater than that of Theseus. Pirithous was left bound, whilst Theseus and Heracles returned to the earth’s surface. Theseus’ life had been greatly changed by his time in the Underworld, for he had lost his throne, lost Helen, and is mother was now in the servitude of Helen. Pirithous though, would never emerge from the Underworld, and would remain imprisoned for ever. There are alternative versions to the myth of Pirithous though, and some claim that Heracles was able to rescue Pirithous as well as Theseus, although if that was the case then nothing more is mentioned of Pirithous afterwards. Others versions of the story of Pirithous have a different tale to tell about the search of the hero for a new wife, believing that a descent into the Underworld was too fanciful. Pirithous and Theseus would actually travel to Epirus, the land of the Molossians and Thesprotians, where there lived King Aidoneus; Aidoneus being a name by which Hades was also known. Aidoneus had a wife called Persephone, a daughter called Core, and a dog named Cerberus. Suitors of Core were expected to fight the dog Cerberus, but Pirithous intended to simply abduct the daughter of Aidoneus. When Aidoneus discovered the intentions of Pirithous, he cast Theseus into prison, and Pirithous was sent out to face the dog, and Cerberus promptly killed Pirithous. Aideoneus would eventually release Theseus from his prison cell when Heracles visited the king’s kingdom and requested the release of his cousin.